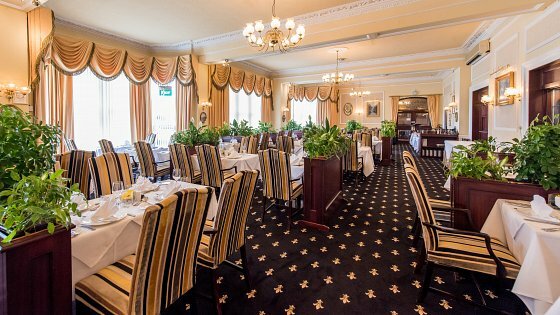 The Arlington Restaurant in Barnstaple has a reputation as one of the best restaurants in North Devon and has recently been awarded an AA rosette for culinary excellence. 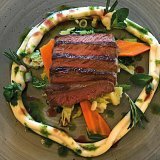 You can choose from the table d’hôte menu, which is changed daily to ensure we make the very best of seasonal local produce or the a la carte menu which bursts with imagination. Our team of chefs are always striving to improve and try new ideas, yet always woth our customers in mind, never ignoring the fundamentals that ensure their meal is nothing short of outstanding every time. Our finest cuisine is complemented by attentive friendly service and the elegant ambience of this beautiful restaurant, with its chandeliers and lovely paintings. We have a live singer performing in our restaurant in Barnstaple on most Saturdays to make your fine dining experience even more special. Non-residents are welcome. Please call us to reserve your table. Please note that sportswear, t-shirts and ripped denim are not permitted.